Faceless is a painting that can be interpreted in many ways and viewed from many canvas orientations, each providing its own unique perspective. 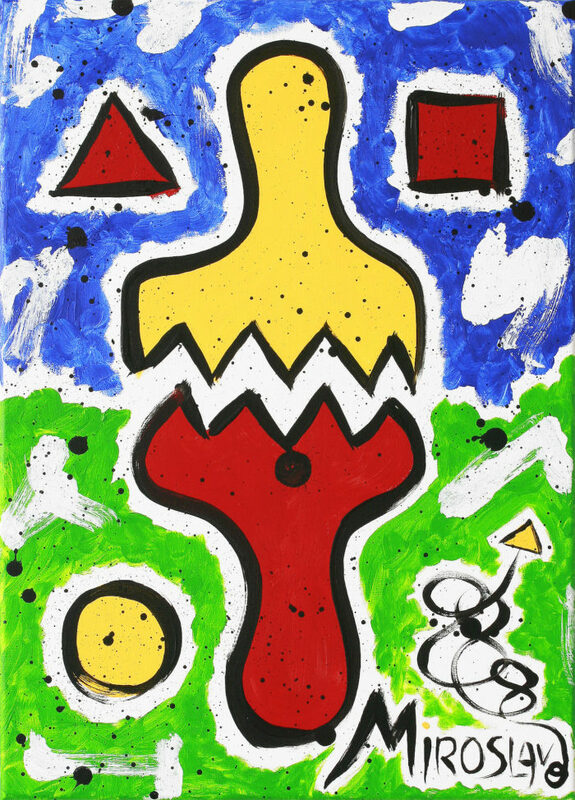 This painting makes use of my traditional shapes—a triangle, rectangle, and circle—along with my vibrant primary colour palette of red, green, yellow and blue. In the middle of this painting is the protagonist—in vibrant yellow and deep red colour bordered by thick black brushstrokes, and spiced up by spontaneous black dots of various sizes—meant to mimic a faceless human head and shoulders. It can be said that even though Faceless does not have a typical face and therefore a specific identity, the opposite is true, his identity lies in his versatility, spontaneity, and open and abstract thinking.